In 1985 Will Wernick first took a commission to design and manufacture a percussion instrument to look really cool on stage from an English pop band called Drum Theatre. Drum Theatre founder member and school friend of Will Wernick, Gary Tarn, knew Will Wernick’s mechanical engineering training but also that he was a sculptor with an eye for 3D form from school days. The resulting instrument was used only as a visual prop in their video as the electronics supplied by someone else never materialised. 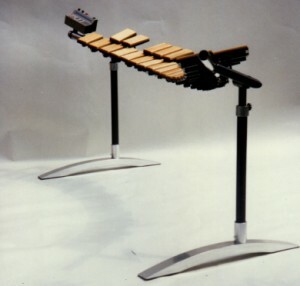 The collapsible lightweight aluminium instrument frame consisted of a curved horizontal bar that could rotate and was mounted on telescopic legs at each end. 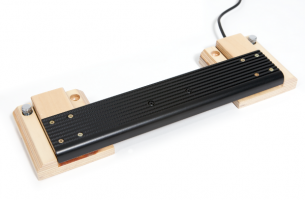 Black and white keys (PVC-covered wood with piezo sensors mounted underneath) were strapped onto the curved bar which could then be adjusted to be banked around the player. The telescopic legs were then mounted on curved feet. The band had the imagination to see that MIDI would revolutionise the music industry with virtually limitless applications but there was no hardware (or software) easily available at the time. CBS, their record label, still own this Instrument and it is most likely stored in their vast vaults. The unique style of the stand became a UK registered design. For the next few years there were small flourishes of activity from Will Wernick’s electronic and mechanical engineering colleagues as well as the machine shop technicians at Rank Taylor Hobson in Leicester. However nothing came to fruition by the time other manufacturers released their mallet controllers and Will Wernick mothballed the idea and accepted defeat. 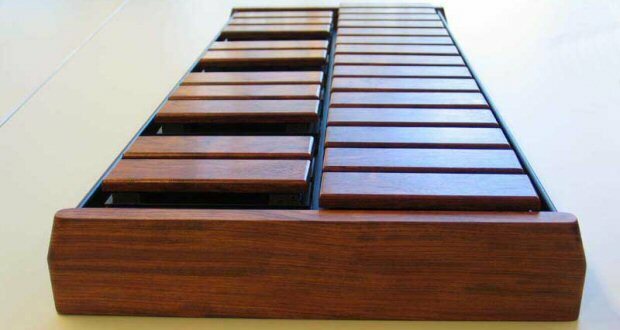 In the early 90s Will started to hear through the age-old grapevine mallet players saying how it would be great to play on an electronic keyboard made with wooden bars. All current instruments had rubber or foam rubber bars to play on. In 1992 Will started developing again with the late Gerry McCavana on software/electronics. Gerry was a previous colleague of Will at Rank Taylor Hobson and they would carry on after work in the evenings. Will had moved to another company, Advanced Metrology Systems, and became a Chartered Engineer (MIMechE) because of his experience and success in designing complex mechanisms and measuring instruments for the manufacturing industry. In 1995, after several years work, Wernick Musical Instruments was established. When it was obvious an instrument was going to work, Will left his job at the beginning of 1996 to work full time on a Xylosynth Mark 1 prototype to show at the Frankfurt Music Messe that spring. This instrument had the same frame design as the first commission but the horizontal tubes were polished and the keys made from ash wood with a natural wood look. But before the show they invited a group of percussion players to London to gauge their reaction. They worked literally all night before the demonstration to iron out some bugs which still didn’t get fully resolved until halfway through the next day. However everyone knew they were on the right track when Will eventually got the instrument working. At the Frankfurt Music Messe they got an even better response. Some members of the public were just staring at the instrument, obviously not having seen anything quite like it before. Editors from all over the world wanted to know more: Modern Drummer, Drum! Sound On Sound, Drums and Percussion to Rhythm. 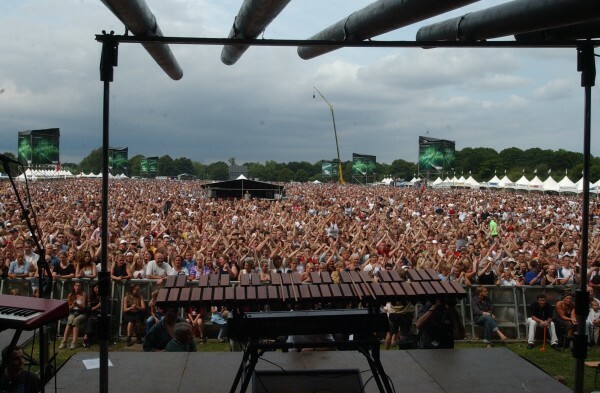 World famous percussion player Katarzyna Mycka recommended the Xylosynth to the German production company she was playing for, the musical Miss Saigon. She asked for thinner and smaller keys and needed a 3 Octave (the mark 1 Xylosynth was only a 2.5 Octave). The Mark 2 (and Mark 3 that could be broken down for transportation) Xylosynth was born. This purchase increased to two Xylosynths as the production company had a new musical, Joseph and the Amazing Technicolour Dreamcoat, and they needed a 4 Octave. These Xylosynths were delivered just before the new year as a teacher, Les Feast, from Kent in England purchased a more transportable version (Mark 3) Xylosynth. Wernick Musical Instruments also began making drum trigger pads, the Wernick Notepad and hand percussion pads, the Wernick Percpad to help sustain Will Wernick as well as two other employees, Will Dickinson and Johnnie Hermiston. In 1998, Anthony Kerr became the first Xylosynth endorsee, helping to develop the Mark 4 Xylosynth and the group UB40 became endorsees for the Notepads . Two 4 Octave MK4 Xylosynths are still used today by the Safri Duo. However the expense of making these instruments with individually mounted keys or bars on a tube made them too expensive for most players. So after letting the employees go in 2000 and working on his own, Will created the mark 5 with cost and transportation in mind. Percussionists wanted to be mobile with their equipment and didn’t have much money to spend. Most had already spent their money on Marimbas. 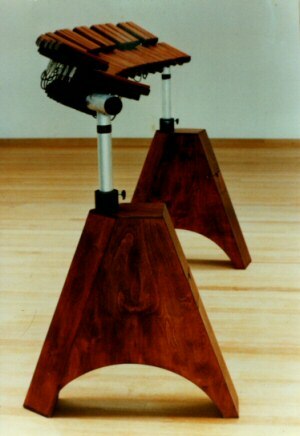 In 2002 Will started taking orders for the MK5 Xylosynth, with a wooden chassis holding the bars in a very cost effective way. The bars could still be individually replaced if they became damaged so not losing their easy maintenance. The late Gerry McCavana’s original electronics were still being used for the new Mark 5 Xylosynth which still used a 40 x 2 character display as well as a button control panel to create patches with 3 keyboard splits and ability to assign any key to any MIDI note number. As the sales picked up Julie-Ellen John became involved, her speciality being production management and wood finishes. James Walker commissioned the first folding 4 Octave Xylosynth and commented that in its flight case, it was built for the back seat of his VW Beatle. Transportation and set up became a lot easier. In 2004 Wernick embarked on modernizing the electronics so that in late 2005 at PASIC the Mk6 Xylosynth was launched. Initially the MK6 had no display, just a simple control panel with jack inputs for pedals. It still kept the Note Length and Sensitivity knobs from the earliest mark for that player intuitive feel. The Xylosynth was relying on the MIDI sound source for the display and any keyboard splits or complex programme functions would need to be carried out in the sound source. The logic being that complex MIDI information would slow down the Xylosynth’s response (not wanting to increase the low latency of about 3 milliseconds) and hence laptops could be used without any noticeable delay with this simpler system. There was obviously a cost saving as well. Options for the MK6 now include a standard general MIDI internal sound set and a display added in 2010 as well as the option of buttons instead of pedals to change sounds which is particularly popular when playing outside. A special U-Frame designed by Will Wernick was introduced in 2011. It is height adjustable to suit small kids to tall adults and has a pneumatic wheel option to allow it to be carted onto football fields (UK registered design). The use of the Xylosynth for marching bands (they are not moved during performance but are normally placed in front of the marching drum and brass lines) has increased and now the top US Drumlines and Drum Corps use them including The Blue Devils, The Cadets and the Bluecoats as well as Carolina Crown.